The Reading Across Borders book club focuses on literature in English translation, with a particular interest in writers who are not (yet) well-known in the English-speaking world. Hosted by former store staffer Helen Chau Bradley, the book club meetings take place every two months, and are open to all. For our next meeting, on Wednesday, November 22, we will meet at La Petite Librairie Drawn & Quarterly (176 Bernard O.) 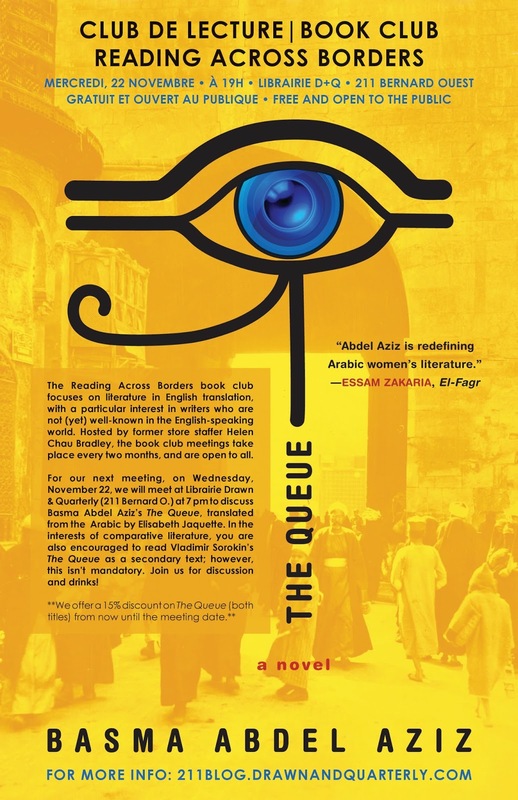 at 7 pm to discuss Basma Abdel Aziz’s The Queue, translated from the Arabic by Elisabeth Jaquette. In the interests of comparative literature, you are also encouraged to read Vladimir Sorokin’s The Queue as a secondary text; however, this isn’t mandatory. Join us for discussion and drinks! We regret that the bookstore is not wheelchair accessible. There are two steps at the entrance, followed by one door that opens inward. Once inside, there are no additional steps to access the bathroom, although the bathroom space is narrow. Alcohol will be served. A queue forms outside the Gate, which has mysteriously replaced the ruling government in the aftermath of a quelled popular revolution. No one in the city can get anything done or their basic needs met without approval from the Gate, but perversely, though rumours fly and people wait patiently, the monumental structure never opens. The ever-forming crowd brings people of all types together, and through their misfortunes, arguments and relationships, we discover the ways in which an authoritarian state manipulates and mobilizes its citizens in its favour. Basma Abdel Aziz is an Egyptian journalist and psychiatrist living in Cairo. Nicknamed “The Rebel,” she has long been a vocal critic of government repression. The Queue is the first of her books to be translated into English, and is reminiscent of Vladimir Sorokin’s late-Soviet era novel of the same name (translated from the Russian by Sally Laird), which also paints an absurdist portrait of an oppressive state via a long and seemingly purposeless line. A very real vision of life after the Arab Spring written with dark, subtle intelligence, The Queue describes the sinister nature of authoritarianism and illuminates the way that absolute authority manipulates information, mobilizes others in service to it, and fails to uphold the rights of even those faithful to it. Sirens, Trains, and Mirrors... a Poetry Sunday amidst Poetry Month! D+Q picks of the Week: new books from Michael Deforge, Vivek Shraya, and Édouard Louis!